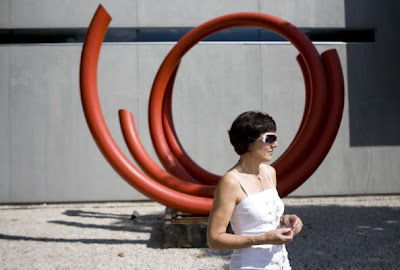 "I simply focused on aesthetics, substance, just powerful art"
Already a stand out in the city of Houston for the superior art it displays, the Sonja Roesch Gallery will turn 21 in February of the next year. To celebrate it, they will feature a group exhibition comprised of many of the artists that have been displayed over the years starting January 14th until February 25th, 2012. The opening ceremony is scheduled for February 4, 2012, marking the 21st Anniversary since the Gallery opened its doors in 1991 in Germany. They moved the gallery to Houston in 1996, and made their entrance with series of satellite summer exhibitions that Roesch organized at the historic Purse Building in Downtown Houston. It is no coincidence then, that they exhibition is themed on the French word ‘Accrochage’, which can refer to the installation of artwork, but can also mean a "collision" or "coupling". One might assume that an oil town like Houston might have trouble assimilating a type of gallery that focuses on minimalist, reductive and concept-based art. To establish a gallery focused on experimentation in art in a somewhat conservative surrounding is quite the undertaking. However, you can look at it in a different way. Perhaps Houston had always needed an outlet for its artsy, creative and experimental side. Perhaps there was a disjointed need for art that needed to be "coupled" with society, and that the Sonia Roesch Gallery was the perfect bridge between the aesthetic ideal and practical society. Adversity or not, they are still one of the most outstanding galleries in Houston, and it's no surprise they've been in business for 21 years. Congratulations to them, and let's hope for 21 more years of excellent art!